Discussions about raising the retirement age have recently intensified in Russia, with the finance and economy ministries calling for the proportion of the budget allocated to welfare spending to be cut. Although Russian President Vladimir Putin has spoken out against this initiative, observers believe that pushing the pensionable age back is a necessary economic measure. Russian Finance Minister Alexei Siluanov has called on the government to raise the retirement age starting in 2016, the TASS news agency has reported. “From the viewpoint of the economy, the quicker we solve this problem, the better it will be for the budget and the economy,” said Siluanov. International experts suggest that Russia raise the retirement age to 65 for both men and women, instead of the current 55 for women and 60 for men, added the minister. Siluanov believes that delaying retirement for Russia’s workforce would provide the country with more labor resources. However, Russian President Vladimir Putin recently spoke out against the initiative during his annual live TV call-in show. His point is illustrated by the fact that in 2014, due to the budget deficit, the government used about 300 billion rubles ($5.9 billion) of future pension savings to pay today's pensioners. Soroko points out that Russia's retirement age is in fact one of the lowest, but it is also important not to forget the average life expectancy. Official data from the Health Ministry says that in 2014 life expectancy in Russia grew to 71, having reached a historic maximum of 65.4 for men and 76.5 for women. According to Alexei Kozlov, chief analyst at UFS IC, raising the pensionable age will cut social expenditure and lead to a growth in the labor force, which will compensate for the demographic collapse of the 1990s – a period in which Russia wallowed in economic depression following the disintegration of the USSR and the switch to a market economy. Pushing back the retirement age will help balance the pension fund, saving the budget from the additional costs of supporting the country's pension system, says Kozlov. 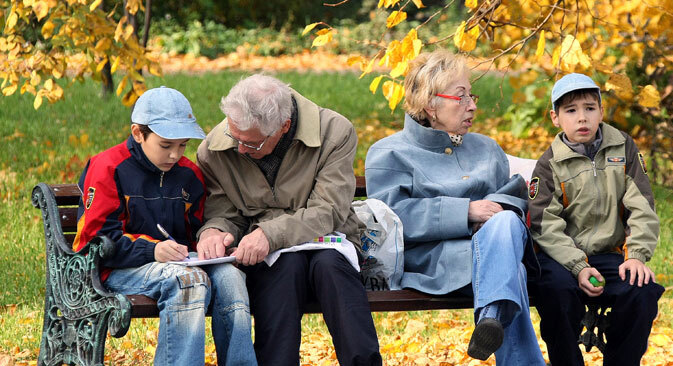 The majority of Russians is against raising the retirement age. In a Russian Public Opinion Research Center (VTsIOM) survey conducted in April 2015, 80 percent of Russian citizens expressed opposition to the proposal. For now Prime Minister Dmitry Medvedev, during an annual account on the government's work, has suggested raising the retirement age of deputies and state officials. “Raising the retirement age during an economic recession or weak economic growth will substantially increase the risks of unemployment for people of pre-retirement age,” warned Alexander Safonov, Rector of the Russian Presidential Academy of National Economy and Public Administration. According to Safonov, this will lead to employers sending this category of citizens into early retirement. He also cautioned that one of the major consequences of extending the retirement age will be high youth unemployment resulting from a lack of opportunities on the job market as older specialists continue to occupy working places.